The home-built VSC/ SAO 10" f/5.6 'Gary Barabino' Fork Mounted Newtonian Fork Mounted reflector. Main construction of the telescope was completed on January 20, 2007. Hello Fellow Stargazers, and ATMs! 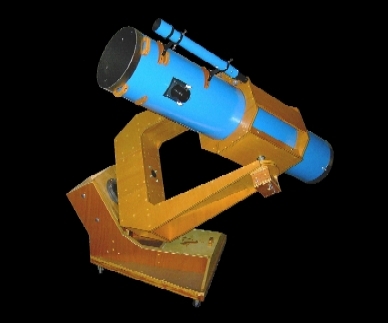 ...and Welcome to the web pages covering the construction of the my telescope, the VSC's "SAO 10" f/5.6 'Gary Barabino' Fork Mounted Newtonian Reflector". The inspiration to build this instrument goes all the way back to the early years of the VSC, when all I owned was a small department store telescope - a Jason/ Empire Model 280 Constellation 60mm f/12 Alt-Azimuth refractor. Now the dream has become a reality. I thank my old friend, mentor, and colleague Gary Barabino for showing me the ropes in the early days, and I dedicate this scope to him. Understanding that if I were to buy a completed factory built scope of this magnitude, it would have cost a small fortune. It has always been the philosophy of the VSC to offset the high cost of manufactured components by building them ourselves. I remember back in the early 1970's when Gary and I would construct our own accessories, such as equatorial mounts, star diagonals, solar viewing apparatuses, and light reducing diaphragms. 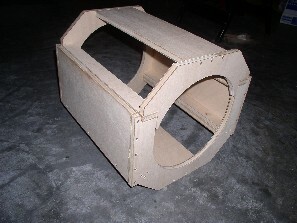 Many items fabricated from cardboard. tape and even first surface mirrors from busted up vehicles in the neighborhood. 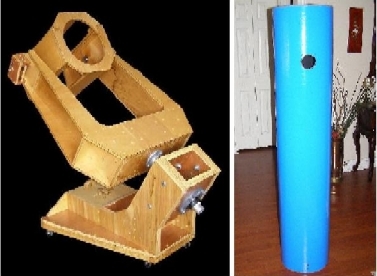 We even designed and constructed an extension tube to help in reducing dew and stray light for our telescopes, which we called the "Obscur-O-Tube". Now companies like "Orion Telescopes and Binoculars" offer the same type of device. However, the cost is much higher than constructing your own. Therefore, we hold fast to our traditions of hand building components and astronomical instruments that will meet, or exceed factory-made specifications at a substantially lower cost. In following suit to this tradition, the idea to construct the SAO 10" Newtonian was pursued. We thought we would also share our efforts with the astronomical community beginning with the pictorial and instructional overview depicting the construction of this fine instrument. More projects are sure to follow. 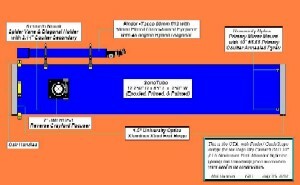 To start your journey, please click on the photos above to take you to a particular components' construction process. We hope everyone will fine this information beneficial in their current and future projects. This day marked another pinnacle in the history of the Vega Sky Center with the First Light testing of the new SAO Coulter 10" f/5.65 "Gary Barabino" Newtonian Equatorial Fork Mount reflector. Gary Barabino of the VAO travel from Waggaman, LA on vacation to the Sunshine State to take part in the first light of this grand instrument. I had just completed test assembling the 10" Newtonian fork mount and decided to go ahead with mounting the optics since Gary was in town to give him the honor of First Light. The scope was rolled out of the garage and the first object of interest we spotted was Jupiter, looming in the constellation Libra. We had not fully aligned the optics in the scope, but they were setup sufficiently for the test. Upon targeting Jupiter using a 26mm 2" GSO eyepiece, we were graced with a splendid image. The Jovian moons Calisto, and Ganymede were on one side while Io, and Europa held tight on the other. The Red Spot was not visible, but I could see the shadow of Io just grazing the limb of Jupiter. Though the optical combination only yield 55x, this gave me verification of the integrity of the mirror. Next it was time to test the optics on a deep sky object. We chose M8, the Lagoon Nebula. Gary took the drivers seat and quickly landed the nebula in the field of view. He focused and gave out Vega's famous yell of "Look at that!...". The intense center nebulosity glowed fairly bright, and the cluster just to side glistened. Not bad for a set of optics created back in 1986 and being used for the first time. We continued sweeping the area of the center of the Milky Way in and near Sagittarius and saw countless stars. Star clusters sparkled like a hand full of diamonds! Unfortunately, the testing/ observing came to a rather and sudden end when clouds begin to filter in from the east obscuring the sky completely in a matter of minutes. Nevertheless, we accomplished what we sat out to do, and that was to verify the optics were of good quality. We concluded the session with removing the OTA and taking out the mirrors to complete the finishing process of the scope.